Now that all the initial bookings have been processed, the initial booking status is available. Pyles buses, now known as Falls Creek Coach Service have run services to falls Creek since Noah was a lad. North East Coach Lines company, under the name HothamBus, are offering a competing service year, to Falls as well as Hotham. I know nothing about them, but you can find out more at their website .On their facebook page they have a special offer on unlimited travel for the season. I think you have to be logged on to facebook to access it. Check the fine print. Unlimited travel pass from Melbourne in 2013 with HothamBus or Falls Bus for $399pp. Resort entry fee's of $16 per person for Hotham Alpine Resort & $13 for Falls Creek are payable on departure in Melbourne each trip. Only 8 seats per departure are available at this fare type. Upgrades available if sold out. Payment due by credit card after 1st April and before the 30th April 2013, with online voucher needed to be claimed by 31st March 2013. Pass is non refundable after first use. The 3 Peaks Challenge on the Labour day weekend was a great success. Here's a great little video of the day. This year the route went up Mt Buffalo and returned over Rosewhite Gap instead of the usual route via Hotham and Omeo. The road was closed for the descent from Falls Creek, and also the trip over TawongaGap. Falls Creek and surrounding areas are becoming a Mecca for cyclists - on road bikes, mountain bikes and recreational bikes. There's plenty of challenge for those who want it and beautiful scenery with respite from the summer heat for the rest of us. It looks like last week's rain has done a great job of putting out the fires in the Alpine National Park. Falls Creek was never in immediate danger but there were a couple of times when winds meant that people had to be prepared for the worst. Falls Creek and the Bogong High Plains are most definitely open and ready for your Autumn adventure or relaxing retreat. The road from Mt Beauty is open as is the road across the Bogong High Plans to the Omeo Highway. There are still vacancies at the lodge for Easter, and for all other weeks for the rest of the "summer" season. The resort is always looking for new activities to increase your options on a summer holiday. Bikes and canoes have been available for hire for a while, but now you can hire a Segway and take a 1 hour tour around the trails. The 3 Peaks Cycling Challenge will run on the Labour Day weekend. As usual it will start and end at Falls Creek, but this year the 3rd peak will be Buffalo rather than Hotham. Why not plan an Autumn break at the lodge and enjoy this beautiful time of year in the mountains? Hotham was in a much more serious position during the fires. I understand that the fire came to within about 50 metres of Anton. The slopes on the Dargo side of Davenport and Summit burnt, as well as part of Blue Ribbon. While normal access to Hotham from Omeo is open, the Harrietville approach has been closed. As well as dangerous burnt trees that need to be cleared and posts that need to be replaced, there are 3 landslips on the road to be repaired. The Harrietville road will open temporarily over the Labour Day weekend, but only during daylight hours. Check VicRoads for details if you plan to head up that way. While this blog is great for sharing news and pictures with members and friends, our main website provides a more formal web presence. It serves as a repository for forms and documents, information about the lodge and club and a resource for potential new members. It's had a major facelift and we've added new some new sections. You can check it out at aacfallscreek.com. The new format should work better on your mobile devices and should also be easier for us to update. Bookings for winter 2013 are open and the initial applications are being processed. The booking status will be published very shortly, hopefully about 19th March. You will be able to see it on the Booking Status tab on this page or click here. We aim to update this regularly until opening weekend and then weekly during the season. Most people arrive late on Friday night. Andrew & Myra provide brekkie & lunch on Saturday & Sunday as well as Saturday dinner. It's great to stock up your locker and catch up with people before the season, but it is first and foremost a working weekend. If you have not already committed to a Hero Pass for the lifts, you can still get an Early Bird Pass. Valid at both Falls Creek and Hotham from Saturday 8 June through until Sunday 29 September 2013. Note that there will no longer be free entry for seniors 65+. However they are eligible for a 10% discount, even if they have younger passengers. You may have heard in the press that the resort boundary is being altered a little. Essentially, the area from the dam wall to the boat ramp will be formally added to the resort, as will some land around the Howmans Gap snow clearing quarters. An equivalent area on the north slopes of Mt McKay are being added to the national park (from the resort). This is a win/win where the national park gets higher conservation value land and the resort gets disturbed land that will let it provide better summer facilities. iii part of the Howman's Gap Snow Clearing Quarters which is currently on a Government road reserve. The area set to be included in resort boundaries. The areas of land being added to the Resort are highly disturbed; the legacy of the Resort's hydro-electric heritage. The Bill also preserves two existing leases over areas associated with the Kiewa Valley hydro-electric scheme. In return, a larger portion of 11.9 hectares of high conservation value land on the northern slopes of Mt McKay will be returned to the Alpine National Park. 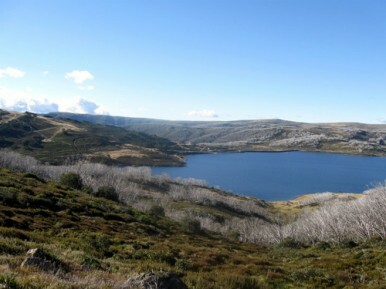 Actions contemplated in the Bill have been supported by the Falls Creek Resort Management Board's recently completed Biodiversity Management Strategy (BMS). The Falls Creek BMS is the first environmental management tool of its kind employed by a Victorian public agency. The BMS comprehensively identifies each ecological vegetation class contained in the Resort. The BMS identified the increased area of land added to the Alpine National Park as well as its significant species of flora and fauna. "The proposed Bill is the culmination of considerable multi-agency cooperation supported by our cutting edge BMS" said David Herman, CEO of Falls Creek Resort Management. "The proposed land changes allow Falls Creek to pursue its access and equity objectives by delivering an all season’s activity base supported by the beauty of the Rocky Valley Lake. Equally, the land returned to the Alpine National Park is of high conservation value, thereby further protecting key species of flora and fauna for all Victorians". Falls Creek photographer Charlie Brown has started up a weekly email newsletter. Every week he sends out 6 photos of Falls Creek, Mt Beauty or surrounding areas. Over the summer some have been action shots featuring mountain bikes, canoes, horse riding etc. Others are just stunning landscape shots. If you are interested in something to brighten up your city week, check out mountainside.net.au . You can subscribe to the email there, or just check out past photos. Just a reminder that the calendar in the left hand side-bar of this blog has dates of interest for AAC Falls Creek members and friends, eg events, expiry of deals, AGM.